Does the Founder have to do ALL the things? There’s so much talk these days about setting up business systems, delegating, and not getting bogged down in less impactful work, that some people mistakenly think this is also how businesses should operate from the start. But starting a business and growing a business are not the same thing. In the beginning, it’s just you – and maybe a co-founder if you’re lucky. Finding the balance between strategic work and getting your hands dirty is one of the keys to getting a successful small business off the ground. Unfortunately, there’s no way around it: starting a new business is hard. In the beginning, you probably do need to do everything yourself. This can be frightening, but it’s not forever. It’s just the stage you’re in right now. But today, I want to encourage you not to shy away from the dirty work! When I started my last business, I naively thought that my co-founder and I would design and build the website and then sit back and watch it grow. How wrong I was! The first couple of years (yes, years!) were filled with decidedly unglamorous activities like delivering flyers, spruiking the business at train stations, answering customer service queries at all hours, putting Ikea furniture together, writing employment contracts, standing in line at the post office, and of course, telephoning thousands of potential customers. In the beginning stages of a business, there is absolutely no point in spending time or money in making something scalable. Until you try something, you really don’t know what is going to work and become an important part of the business, and what you’ll want to bury under the carpet as a bad idea. Could I have hired promotional staff to do my spruiking for me? Absolutely, but then I would have spent time and money in recruiting and paying them, but more importantly, I wouldn’t really know if the reason it didn’t work was because they didn’t do a good job, or because it was a bad idea. Could I have hired telemarketing staff to call potential customers? Yes, and I later did this. But not until I had learned enough to develop a decent sales script and could identify which types of potential customers to contact. The most important thing is that you do whatever it takes to get customers and make them happy. Nothing should be beneath you. When do you move from ‘getting your hands dirty’ to doing more ‘strategic stuff’? For most successful business owners, there is no sudden jump from being ‘hands on’ to being strategic. Instead, there is a slow and gradual progression (that might take many years) towards spending more time on more strategic tasks. The best way I know to tackle this, is to think about the various different roles you play in your business. You can do this by noting down all of the different tasks that you perform and categorising them. For instance, you might be the sales consultant, accountant, procurement manager, warehouse manager, marketing coordinator and more. You might also have some more strategic roles like marketing strategist or business development manager as well. Instead of scrambling from one to the other and filling up your week like that, try deliberately switching between the different roles. Some people find it useful to plan out their week to ensure that everything gets covered off. For example, Monday morning is accounts and admin day, Tuesday morning is marketing, each afternoon is sales and customer calls, etc. Then decide which role you’ll fill first. This could be the biggest pressure point of the business, or it could be a role that you don’t enjoy or an area where your skills are not great. It seems that business owners fall into two buckets – those that recruit people way before they can afford and justify them, and those that put off recruiting way too late (leaving the business and sometimes their health to suffer in the meantime). To avoid either of these scenarios, set profit or revenue milestone goals for your recruiting. For instance, ‘when our monthly revenue reaches X, we’ll hire a part-time customer service person’. Have a plan for which roles you’ll recruit for and in which order, and the milestones attached with each of these. 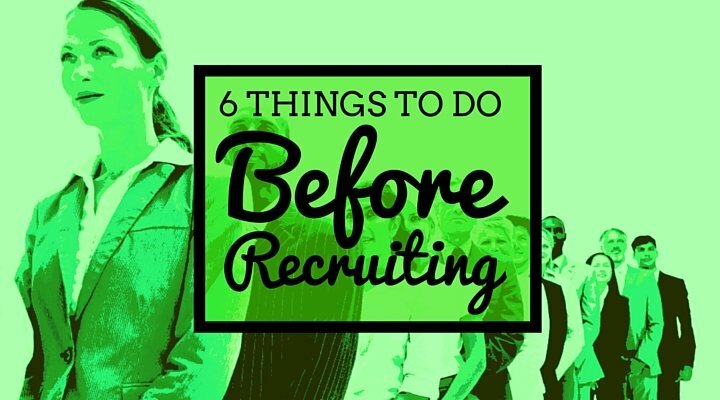 This ensures you’ll be recruiting only once it’s financially viable. Having these goals in place, gives you something to aim towards with your own efforts as well as the peace of mind from knowing that you won’t always have to do everything! But in the meantime, know that you’re doing the right thing by by strategically getting your hands dirty! Thank you Fiona. This very encouraging to read and great advice. I am doing everything myself at the moment and it can sometimes be overwhelming. I have been trying to nominate a day for prospect calling and a day for bookwork but sometimes that order gets thrown out the window if I’m out on a job.